Lauren Conrad went back, back to the beginning this past weekend when she had a mini Laguna Beach reunion with some of her former costars (and high school classmates). The fashion designer attended the wedding of Dieter Schmitz - the pal who famously dried her tears after she caught Jason Wahler cheating on her at a charity fashion show during the show's second season - in Monterey, CA, on Saturday. The stunning wedding was also attended by Lauren's former on-again, off-again crush, Stephen Colletti, and friend Trey Phillips. Lucky for us, the whole gang took to social media to document their sweet reunion and to celebrate Dieter and his new wife, Isabell Hiebl. 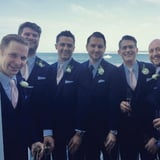 Lauren posted a photo of the newlyweds, while Stephen, who served as a groomsman, shared a snap of a special moment between him and Dieter, writing, "One proud groomsman. The German king scores himself a lovely Austrian queen. And all is well . . ." See more photos from the day below, then check out what the rest of the cast is up to these days.